Alex and I headed to Tulum Beach to see the changes that were happening at Cabañas Tulum. 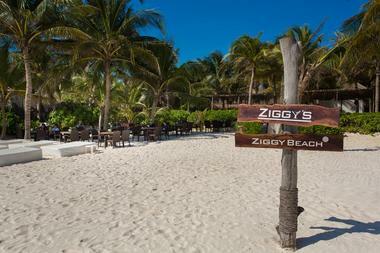 I love to check in at The Beach, Cabañas Tulum and Ziggy's whenever I am in town; it is one of our favorite spots. We decided since we had done several reviews on Ziggy's, we would stop and try a new place. The first place we stopped had construction going on and, in the midst of drilling and hammering, they were trying to offer lunch. We walked in and saw people were at some tables, however no one bothered to greet us. We walked to the front, looked at the lovely view and decided to move on. Note we have not given the name; we believe if we can't give a positive review, it is best to let it go unnamed. The second place we stopped was also a very pleasant place. The view and the flora were so beautiful. We commented how nice it was to find a new, hidden place. We had a seat and put in our order. I ordered a Michelada but, when it arrived, it was terrible. I sent it back and asked for a chelada instead. They brought me the lime juice and salted glass but not another beer, I guess expecting me to use the half a beer I hadn't yet poured. I pushed and they did finally bring me a cold beer. Now time to decide on lunch. One thing that has changed in Tulum are the prices. When I am not in the Riviera Maya, I reside in Charleston, S.C., one of the top foodie cities in the U.S. Tulum prices are as high or higher than prices at fine dining establishments here. We decided to try the beef nachos—for which they wanted close to $10 US. We laughed and said they had better be great. Well, if you think Velveeta cheese in Mexico is great, then you would love these. We did not and, on top of the fake cheese, the beef was extremely salty. I have no problem with paying top prices for great food, but this was inedible. We settled our bill, finished our drink, and left the rest of the nachos untouched. On to Ziggy's! Sometimes it is best to stick with what you know. Is Ziggy's a bit pricy? Absolutely, but you will get no complaints here! It has a view to die for, food that is unique and rivals any fine dining establishment, and a pleasant and professional staff. I immediately apologized for attempting to try somewhere else. I felt a bit like Goldilocks: the first was too noisy, the second was poor food, but the third was just right! We settled into our familiar seats with the magnificent view ofTulum Beach and immediately started to relax. The menu has been updated recently and there are some great new items to choose from. We felt comfortable with trying something new in a place that feels like home. I opted for the tequila shrimp tacos. The three tacos had shrimp sautéed in a chipotle cream sauce with epazote, red onion, tomato, Manchego cheese and cilantro, and then flambéed with tequila in a lovely display. Alex ordered the pork chop wrap with caramelized onions, lettuce, chipotle, honey and ginger mayonnaise, with fries and crudités. The flavors in both dishes were remarkable, the fresh ingredients and impeccable seasoning made for a perfect meal, and we quickly forgot the frustrating start to our day. But we can't forget why we were heading to Tulum in the first place. Cabañas Tulum, just a short distance from Ziggy's, was undergoing renovations. Cabañas Tulum was one of the first places I ever stayed in Tulum, besides staying with friends in a villa. I found it extremely comfortable and very enjoyable (http://www.sac-be.com/cabans_tulum_rev.shtml). I couldn't wait to see the changes they had made. Detail to design is key to the décor of the newly renovated Cabañas Tulum. It is no longer a somewhat funky property with colorfully whimsical parts mixed with basic beachfront rooms. No, the new look is totally tasteful and the resort now flows with a calming, classic feel. Some rooms have been converted into suites and the updated reception area is welcoming, setting the tone for the entire property. In the back of the property they have added a lovely deck and small, but perfect, pool. With Tulum Beach at your doorstep, you won't be spending a lot of time by the pool, but it is certainly a great addition. Cabañas Tulum—job well done!